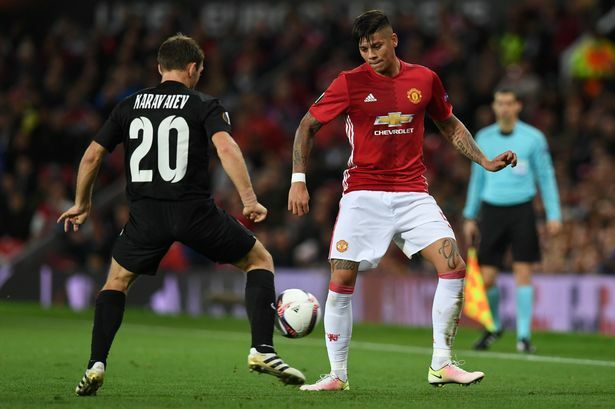 United weren't great as a team against Zorya but even by his standards Marcos Rojo plumbed new depths with his performance against the minnows. With Luke Shaw injured and Daley Blind rested, he was given a rare opportunity to impress Mourinho at left-back but he once again failed to show any composure or intelligence on the ball. He offered virtually nothing going forward, his positioning wavered from bad to non-existent and despite the hosts enjoying over 70% of possession he was done for pace on more than one occasion by the visitors' eye-catching winger Oleksandr Karavaev. Any half decent left-back should give you speed and solidity, offering attacking impetus and defensive assurance in equal measure but Rojo offers neither and instead oozes mistakes and impotence down the left- a hapless recipe that will surely consign the Argentine to the Old Trafford backwaters. Like many, you perhaps felt that it was Louis van Gaal's inability to get the best out of his players that caused Rojo's regression but there has been no improvement to his game under Mourinho and he is simply not good enough. He could be considered unlucky to find himself behind one of the country's best left-backs in the pecking order but Luke Shaw will have been watching on without a worry in the world after another abject showing from the much-malinged Argentinian. When Rojo signed for £16 in 2014 he showed early promise- and was voted man of the match in last season's Old Trafford derby- with some taking a liking to his robust style but instead of improving he somehow seems to get worse every time he is somehow given a starting place. I'm not one for criticising players but I, like many others, remain astonished how Rojo is still at our club let alone even in the squad. How he is still getting chances in the team- albeit in the Europa League- while Cameron Borthwick-Jackson has been loaned out to Wolves, is beyond me. Even without the talented young full-back who enjoyed an impressive breakthrough last term, Daley Blind, Ashley Young, Matteo Darmian, Joe Riley and Tim Fosu-Mensah are better options when Shaw is not fit. Damian is likely to leave Old Trafford in January and Rojo should be the first the join him in the departure lounge. Even Alexander Buttner showed more promise in his time at United than Rojo has (or ever will) and surely his lacklustre showing against Zorya will ensure he is soon on his way out.